Johnny Bobbitt, the homeless man who helped a stranded motorist, is living in a new camper in rural Burlington County. Johnny Bobbitt has traded life on the streets for the refuge of a camper in rural Burlington County. But he continues to battle the demons that left him homeless under an I-95 bridge in Philadelphia. He still struggles with an addiction to heroin and opioids and is in his second stint in rehab. He is jobless, and the truck he bought with money from a life-changing windfall sits idle and in need of repair. Six months ago, a small act of kindness brought Bobbitt, 35, an unexpected fortune — and international attention — after he spent his last $20 to help a stranded motorist whose car had run out of gas near his perch in the shadow of the highway. In gratitude, Kate McClure set up a GoFundMe campaign and her appeal went viral. More than 14,000 people contributed $402,706 to the cause. Bobbitt and McClure appeared on Good Morning America and were interviewed by the BBC. McClure and her boyfriend, Mark D'Amico, pledged to buy Bobbitt a new house, his "dream truck," a 1999 Ford Ranger, a computer, new clothes, and a cellphone. They said they had set up two trusts in his benefit and hired him a lawyer and a financial adviser. Bobbitt joined them in interviews in which he spoke enthusiastically — and gratefully — of his good fortune. Johnny Bobbitt, Kate McClure and Mark D’Amico during an interview in December at a hotel where he stayed when he first got off the street. Months later, the spotlight has faded and reality has set in. 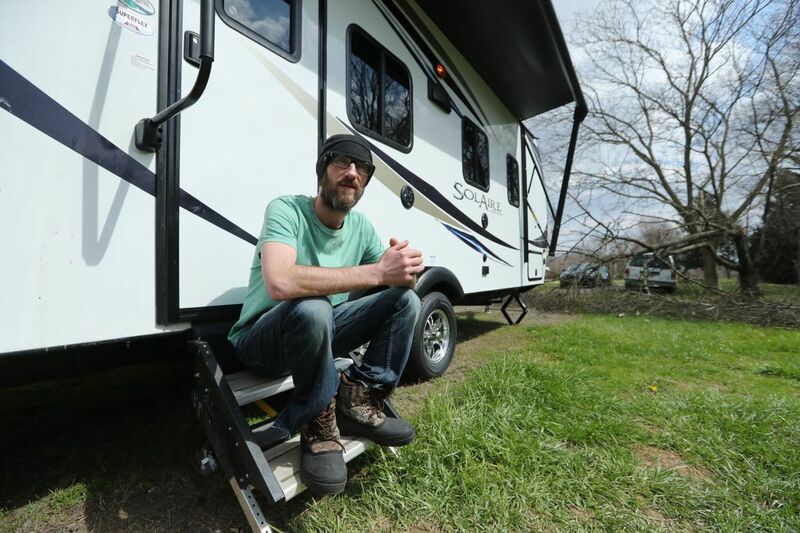 The promise of a house gave way to a camper — his choice, Bobbitt says — parked on land McClure's family owns in Florence, Burlington County, where she and D'Amico share a small house. The truck Bobbitt had coveted remains out of reach and the one he settled on instead wasn't running and needs a new fuel filter — and in any case, he doesn't have a driver's license. He admits using some of the money from his many benefactors to buy drugs — a "small amount," he said, without elaborating. McClure and D'Amico now ration the money they give him for daily living and will not say how much money remains, how it is invested, or whether Bobbitt will ultimately be allowed to control it. The camper and the truck are both registered in McClure's name, D'Amico said. McClure and D'Amico agreed to speak only briefly. They declined to discuss many aspects of their relationship with Bobbitt, financial and otherwise, citing an exclusivity agreement that came with a recent book deal. There has been tension between them and Bobbitt, even as they work toward a common goal of helping him rebuild his life. "I'm appreciative of the help," Bobbitt said in a recent interview. As for the future, he is hopeful, but realistic. The spell of addiction has gripped him for years, he said. "I didn't get involved in drugs overnight," Bobbitt said as he stood outside the white SolAire camper. "It's going to be a struggle for the rest of my life." He said he is clean now, sober for three weeks and enrolled in an outpatient drug program that involves daily counseling, group meetings, and drug testing. On a recent day, D'Amico was driving him to rehab. D'Amico and McClure encourage and support Bobbitt, even as they ration his money. "I don't want him to do anything stupid," D'Amico said last week. "He's a drug addict. That's like me handing him a loaded gun. He has to do what he has to do to get his life together." McClure is more sanguine. She said she is encouraged by Bobbitt's progress. "He's a great neighbor," said McClure, 29, who works as a secretary for the New Jersey Department of Transportation. She and D'Amico invited Bobbitt into their home during the holidays and posted pictures on social media of the three of them by the Christmas tree and in the kitchen baking cookies. She says he is welcome any time. D'Amico, 38, a carpenter, said the couple are committed to helping Bobbitt. It's not clear to any of them how long that will take. Johnny Bobbitt near the camper he hopes to take to Montana to start a new life. Bobbitt, for his part, wants his freedom and more control of his destiny. He dreams of driving cross country and starting a new life in Montana. Yet he recognizes that sobriety is elusive and that he has not been clean for long. He said he feels "unsettled" because he wants to leave New Jersey and stay away from Philadelphia, where he was homeless for so long. Friends, knowing of his good fortune, have asked him for money, he said. It makes him uncomfortable. A Marine veteran, he said he has shared some of his money with others in need, and on social media, he encouraged his GoFundMe donors to contribute to a fund-raiser for a fellow veteran. As for his newfound wealth, it is largely beyond his reach. Bobbitt feels ready to take more control. "I'm 35 years old. I haven't always been a drug addict," he said. "At some point, people have to put trust in me." Bobbitt said his drug habit began while he was living in North Carolina and working as a paramedic and on his family's farm. "I was a functioning addict," he said. Then things fell apart. He lost his fiancee and the trust of his parents. Bobbitt said he needed drugs just to feel normal. "Nobody wants to be a drug addict," he said. Bobbitt said he came to Philadelphia for a warehouse job that fell through. He ended up on the streets and slid back into drugs. It was in Philly that he learned humility, he said. "I got up here and I used one time. It's the worst thing I did. I thought I could just use once or twice, but now I know I can't," said Bobbitt, his bright blue eyes framed by black framed glasses. Now, he said, he cares more about happiness than anything else. He wants to go to Montana or Alaska. He's anxious to start over. He realizes he has to stay in rehab.